Lying on the fringe of the Andaman Sea off the west coast of Southern Thailand, the island of Phuket is approximately 890 Km from Bangkok. It is Thailand's largest island at 550 sq km, roughly the same size as Singapore. The name Phuket is apparently derived from the word bukit in Malay which means mountain or hill, as this is what the island appears like from a distance. 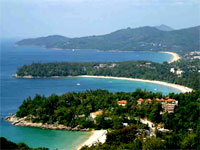 Phuket is surrounded by many smaller islands that add a further 70 sq km to its total land area. Phuket is separated from the mainland by the Chong Pak Phra channel at its northernmost point, where a causeway connects the island to the mainland. Phuket is quite mountainous. There are a couple of peaks above 500 m, the highest being Mai Tao Sipsong at 529 m. Many of these are covered in lush jungle. The lowlands consist of rice paddies, plantations of rubber, pineapple and coconut as well as the only significant area of rainforest remaining on the island, Khao Phra Thaeo Park which is now protected. The most beautiful beaches are found on the West coast, separated by rocky coves and headlands. The east coast comprises limestone shoals with only a few sandy beaches while spectacular limestone islands adorn the horizon. Coral gardens full of exotic marine life dot the emerald waters surrounding the island. Tourism has dominated the island's economy for the past two decades. 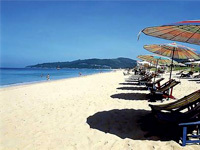 Each year, over 3 million visitors arrive to enjoy Phuket's natural splendour and many amenities. Although Phuket is an island, getting here is very straightforward. The majority of tourists arrive through Phuket International Airport (HKT). However, you can also get to Phuket by road, rail (in a roundabout way), and of course by sea if you have your own boat. Well paved roads service the island, giving ready access to all beaches, retail centres and the administrative centre of Phuket Town. The best and safest form of transport is a self-drive air-conditioned vehicle (car or 4 wheel drive jeep); motorbikes can also be hired (be cautious of traffic hazards and wear a crash helmet). You then have the freedom to explore the island and its treasures at your own pace. A private car and driver can also be arranged by your concierge service.